@ChasingASMBlog WAR OF THE REPTILES. Period. For those keeping score at home, Dan is referring to the “epic” Amazing Spider-Man #165-166. From this point forward I abdicate all responsibility for what I’m about to write. This is all Dan’s fault. On a somewhat seasonal note, this storyline was actually winter “holiday” themed. Since today, the Friday after Thanksgiving, is the “official” start of the Christmas and winter holiday season, I hope this post brings you some goodwill and cheer courtesy of Stegron the Dinosaur Man. For a full archive of my Reader Request Month posts, click here. I’m trying to find the words that accurately describe my expectations the day I decided that Chasing Amazing would be a living breathing internet thing, but to be totally honest, I’m at a loss for what to say. On the surface, I figured Chasing Amazing would be a vanity project that would allow me to write about a topic I love for a non-existent audience, because who really wanted to read what I had to say about Spider-Man comic books and my collection? But I’m naturally a competitive person who never goes into something with the expectation of failing. I was going to doggedly promote this blog any way I could, despite working a full-time job and trying to support my wife and (at that point) soon-to-be-born first child, and through that hard work and perseverance and audience would be unearthed. Soon after launching a dedicated Twitter account for Chasing Amazing, I started to get tweets from someone named Dan Gvozden. He was one of a very small handful of first fans who was legitimately engaged by what I was writing. Sometime around June of last year, I received a direct message from Dan asking if I was ever interested in doing a Spider-Man podcast. I expressed mild interest but never followed-up with him. It was nothing personal, but as many of you might note, a few months after that direct message, my posting had become grossly inconsistent, to the point that I didn’t write a single blog entry on Chasing Amazing last November. It was a combination of factors – being overwhelmed at work and home, uninspired as a writer, and generally disappointed by the storylines in the comics (in retrospect, Marvel was clearly running out the clock for its big game-changing reveal in ASM #700 last year, and as a result, I found the bulk of last year’s big stories like “Ends of the Earth,” and the Alpha and Lizard arcs to be mediocre-at-best). Like good old George Bailey, I started to question whether or not the Internet would even miss me if I just walked away from it all – if Chasing Amazing had never existed. My ego wouldn’t allow me to dedicate so much valuable time and energy to a project that wasn’t going to be appreciated by a consistently growing audience of people. If this sounds absurd to you. It should. This is a personal blog. Why should I care so much about how many other people read it and what they thought about it? And what does it have to do with ASM #165-166? I’m getting there. The hype surrounding ASM #698’s release last November was palatable and after finally reading it, I suddenly found my inspiration coming back to me. 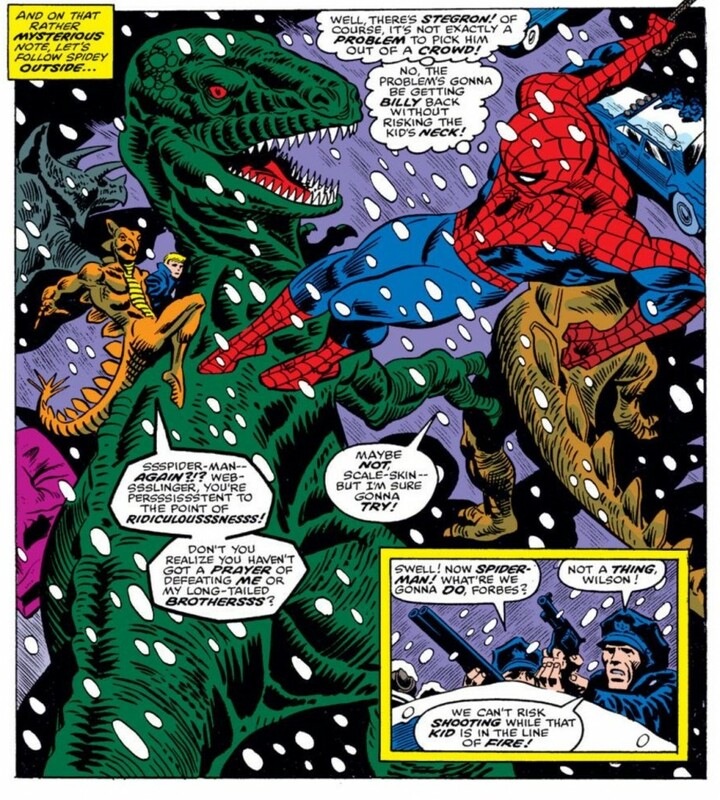 I published a series of short posts filling in the gaps from the last time I had written about a new ASM issue and then dove enthusiastically into my post on ASM #698. It didn’t generate much response, but I decided at the very least, I would push onward until ASM #700. In my write-up about ASM #699, I talked a lot about the awful death threats writer Dan Slott got from people around the Internet. It was an impassioned plea to long-term Spider-Man fans to not let a status quo shift bring out the worst in us as a fanbase. I think comic book “nerds” get a bad rap as it is. It’s still a part of my life that I go out of my way to shield from the people I interact with in my “professional” life. Amongst the comments on that post was one from Dan. I recognized his name from our Twitter conversation earlier that year. And I will be the first to admit, it was nice that one of my “first” readers was back and reading Chasing Amazing after my unexcused absence. In a way to jump start my official “return” to blogging, I turned to the tried but true well of Internet posting by crafting a “top 10 ASM issues” list for the site. It was designed to be a very personal list with some controversial choices – not for the sake of controversy mind you, but because I wanted to emphasize how different comics mean different things to different people. As I got to the final two in my countdown, Dan started to tweet me, asking when “War of the Reptiles” was going to make an appearance. The joke landed – despite the fact that Dan repeated it a few too many times (he’ll readily admit this to me today). 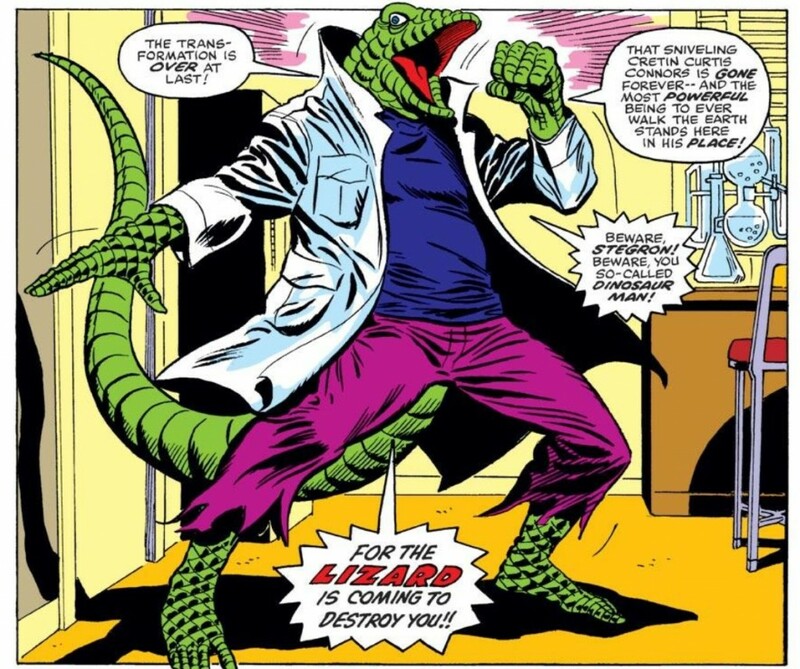 “War of the Reptiles” is the epitome of absurd Bronze Age Spider-Man storytelling. A time when creative teams were apparently tired with the classic rogue’s gallery and instead came up with a new villain of the month, each one more absurd and ridiculous than the last. 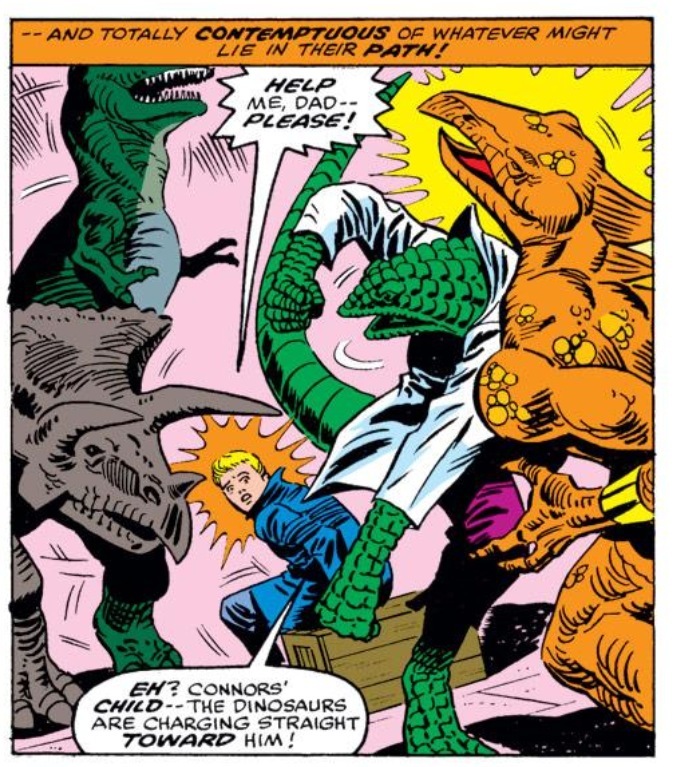 Like Curt Connors and his Lizard persona, Stegron is actually a man who genetically merged with dinosaur DNA. Unlike Connors, the character is not even remotely sympathetic or interesting to read about. 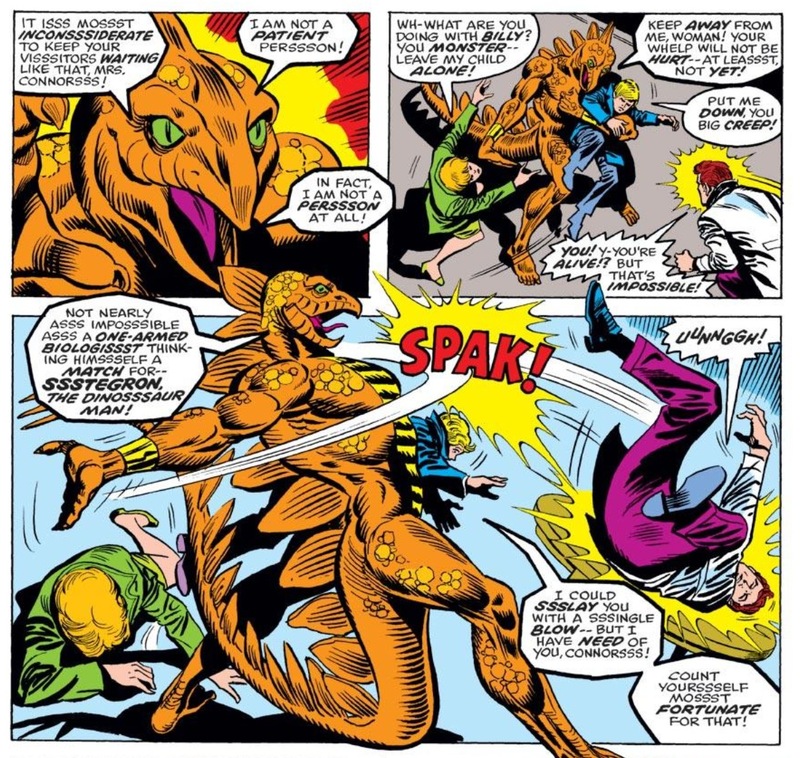 When Spidey fights the Lizard, there’s always drama to the fact that in human form, Curt is a good person and an ally of Spidey’s who’s bailed him out of trouble a few times. 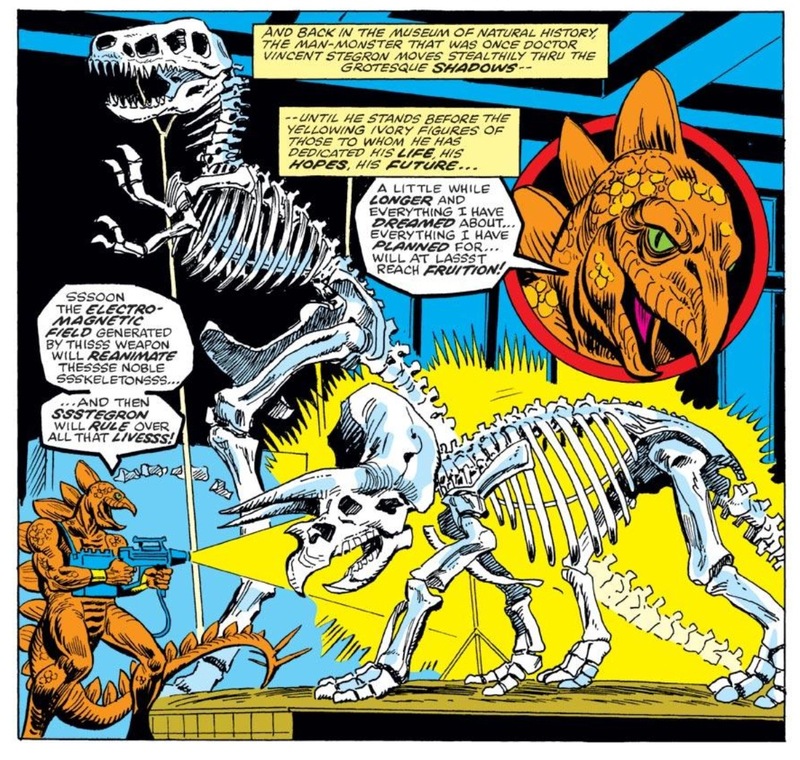 With Stegron, he was just a bad guy who went to the Museum of Natural History in New York and reanimated dinosaur bones. It’s like Michael Crichton’s Jurassic Park if it was written by someone who was about 12 drinks and a bowl of marijuana into the evening. What always kills me about the Bronze Age era of Spider-Man is that these issues were chock full of interesting “B” stories. 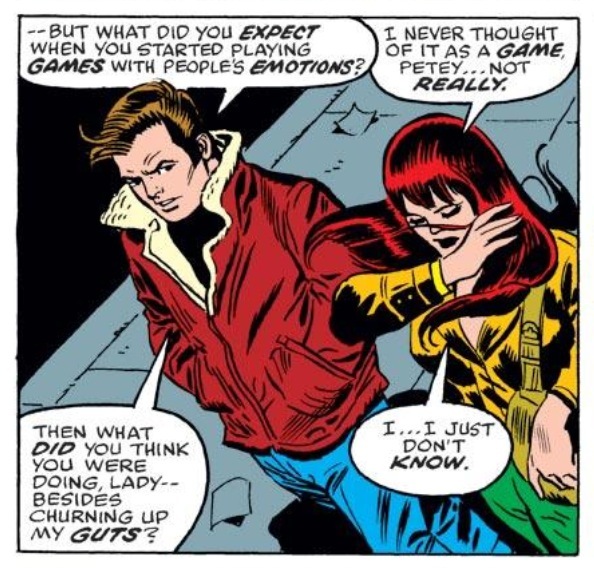 In these issues, we get an amazing heart-to-heart between Peter and Mary Jane about the fact that she just refuses to settle down and be in a committed relationship with him. It’s the precursor to Peter’s failed marriage proposal and MJ’s disappearance from the title for years, before finally returning in the 80s a more mature, ready-to-settle-down woman. 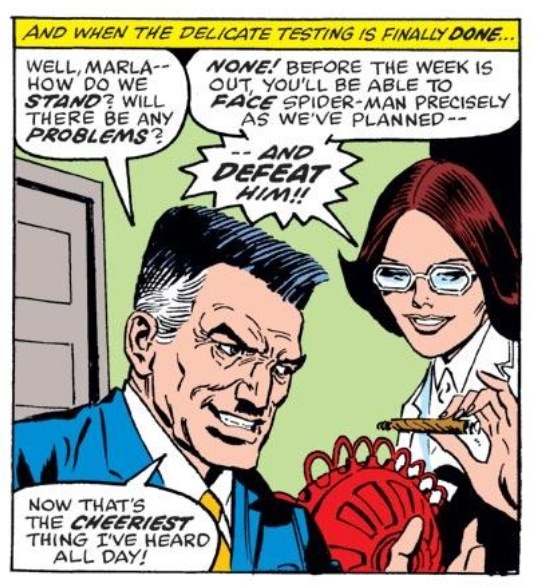 These issues also mark the evolution of the J. Jonah Jameson and Marla romance that lasted until the character was eventually killed in Dan Slott’s “Big Time” arc a few years ago. Up until that point, there was something almost asexual about Jonah that the idea that he could find love (and have it be someone who would actually enable his hatred of Spider-Man by creating an improved version of the Spider Slayer) was absurd. In retrospect, I think it’s great that Len Weinn and Ross Andru took the risk and decided to do something proactive with Jonah on a romantic level. But my goodness, the “A” stories between Spider-Man and the villain du jour – whether it was Mirage, Cyclone, Grizzly or Stegron – were just absolutely brutal. Characters that history has mostly forgotten (unless they randomly show up in Superior Foes of Spider-Man). I know some of you think I’m unfair to the Bronze Age era of Spider-Man, but how can I not be when so many of these stories are scattered throughout? It’s been almost a year since Dan made his initial “War of the Reptiles” joke, and now the site is stronger than ever. I got more submissions for this feature then I could realistically tackle (if I didn’t get to your request, I sincerely apologize and how we can do something like this again in a few months), but I felt it was imperative that I include Dan’s somewhat sarcastic submission of “War of the Reptiles” this time around. That’s because, despite my ego, I know I owe, in large part, Chasing Amazing’s current vivacity to Dan. Months after he unknowingly cheered me up by leaving my blog a comment and then tweeting a joke to about my “Top 10” list, Dan approached me again about the podcast, and this time, we put our heads together and came up with a system that seems to be working out (aka, Superior Spider-Talk!). But beyond page views and podcast popularity, I credit Dan for something else of a totally different color. I got to meet Dan in the flesh for the first time this past summer and we spent a good 36 hours together covering Connecticut ComiCONN, interviewing the likes of J.M. DeMatteis, Mark Bagley and “the legendary” Tom DeFalco. I invited Dan into my home, to meet my wife and son, and by the end of the weekend realized I not only had a podcast partner, but a legitimate friend. When I was covering New York Comic Con in October, I would check in with Dan every day to let him know how the show was going and who I had interviewed that day for the podcast. By day three, I had completely hit the wall. Between the crowds and getting blown off by a creator I was trying to speak with for a few minutes, I was just done with NYCC. I e-mailed Dan that night saying that while I would be going to the Sunday session, I wasn’t feel good about it. I was starting to question everything I was doing in this venue again – if I couldn’t get a creator to talk to me or recognize me or my name, then what was the point? Dan sent me an e-mail that I won’t describe in detail, but was absolutely the shot in the arm that I needed. That morning, the first person I sought out was Alex Saviuk, who illustrated the first issue of ASM I read when I was kid. When I approached Alex, I led with that personal anecdote, and he was so gracious that I told him that story, we ended up having an amazing conversation for the podcast. Without Dan’s e-mail … No … without Dan’s friendship, that might have been a lost opportunity for me. I might have been circling the drain so hard, I would have had a dull conversation with Alex, or perhaps I would have chickened out and not spoke to him altogether. And I would be kicking myself for that probably for the rest of my life. So yeah, “War of the Reptiles” is a terrible story, but the story behind the story – which has almost always been the thesis of what I write about on Chasing Amazing – is probably one of my favorites. It’s a story about how a silly conversation over the Internet can spark a lasting friendship with someone, who would have otherwise been a stranger in my life, if I had never launched Chasing Amazing. The Wein/Andru run is interesting, because on the one hand the stories offer very little in the way of emotional stakes, but on the other hand, they succeed entirely in what I believe the creators were trying to do. For Wein and Andru (and this is totally my own conjecture based on the evidence in the comics, mind you), the goal of developing the drama of Peter’s life played second fiddle to the goal of telling visually interesting stories. So for instance, while War of the Reptiles features a bit of insight into Pete and MJ’s relationship, the main draw is the fight with Stegron through various attractions in the natural history museum (at the time, Andru lived in NY and loved taking reference photos). The light show in that issue would also have a been a big draw for teenage readers. My parents grew up in NY during the 70s, and both of them have fond high school memories of smoking weed and going to the museum to watch the laser light show (which I believe had a Pink Floyd soundtrack). Once I came around to this way of thinking, that the main goal of the story was to give Andru cool things to draw and the reader cool things to look at, I found myself enjoying Wein’s run a lot more. And to sort of provide a counterpoint to that, think about the latest Superior, where Spidey fights Stunner on the ESU campus. Now if that had been an Andru/Wein comic, they would have knocked over a historic statue of one of the college founders, they would have been tossing bookshelves at one another in the library, etc (all visually interesting), but instead it’s a short scene where Spidey saves Anna Maria and Lamaze acts likes a jerk (all character drama). I’m not knocking Camuncoli or anyone here, just noting that there are different sensibilities as play. Great post. The podcast is amazing and I look forward to reading this stuff every day.